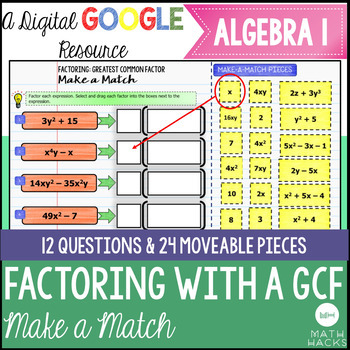 Use this Factoring with a Greatest Common Factor Make a Match Activity to practice factoring expressions with a GCF. Use it as a warm up, in-class activity, or homework assignment. Students factor each expression and drag and drop the two factors next to the matching expression. This activity includes 12 questions with 24 moveable pieces. Each question has a greatest common factor but cannot be factored further. Students use a pre-made text box to type their name and then use the mouse (or finger if using a mobile device) to move the yellow pieces. 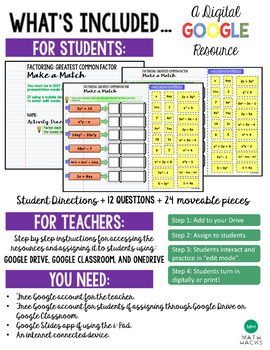 Students can submit this Make a Match activity back to you using your digital classroom platform or via email. Grade responses right in the document and provide feedback using the built-in comment feature in Google Slides. Not ready to assign a digital activity? This activity is formatted to print on an 8.5 x 11 sheet of paper and can be turned into a cut and paste activity by simply printing both pages for students! Upon purchase, you’ll download a PDF file with directions on how to access the activity mentioned, as well as how to assign it to students using Google Drive, Google Classroom, and OneDrive. Please read the requirements below to make sure your classroom can use this activity! Both you and your students will need free Google accounts if you will assign this activity using Google Drive or Google Classroom. An internet connection is also required. While text can be added to this document and pieces can be moved around, the directions, questions, and slides/page designs are not editable. If using iPads, the free Google Slides app is required as students must work in “edit mode”, not “present mode”. Google Drive documents are often compatible with Microsoft OneDrive, so directions for assigning this activity to students using OneDrive are also included. In this case, only the teacher will need a free Google account to access the documents. An internet connection is still required for both teachers and students. If you like this digital resource, you may also be interested in the Translating Words to Symbols Make a Match Digital Activity. Click on the green star near my store logo and follow me here on TpT to receive information and product notifications. You can also follow me on Instagram, username @msmathhacks. Stop back and let me know how it goes! By leaving feedback, you can earn credit towards future TpT purchases! This document is for single user/classroom use only. If you'd like to share the document with a colleague for their use, you will have the option to add additional licenses (at a discounted rate) at check out. If you’d like to add a license after purchasing, go to My Purchases under your TpT account, select this product, and add the desired number of licenses at a discounted rate.